This volume was focused much more on the characters and their relationships to each other than on the pop idol music scene. Which is good, because these are great characters and the relationships are written in a way that's very real. There's a big twist towards the end of the volume, which is bound to have a huge effect on the plot going forward. I also really liked the bonus chapter, which gives Eichi's POV of his relationship with Mitsuki. Mitsuki loves Eichi and that has kept her alive. She promised that one day would become a singer and they would meet again. But, it's been hard to keep her spirits up. Even the memories of Eichi aren't helping. And when it's let slip that Eichi has been dead for years, Mitsuki can't take it.Will Mitsuki join her love in death, or will the love of another be enough to make her want to live?This volume doesn't focus so much on singing as the previous two. It is more about character development and their relationships with one another. It's a sad but touching volume. I can't wait to see how the story continues. As seen on my blog www.amartians.nlReview for the entire series5 out of 5 starsFull moon wo Sagashite is a 7 volume manga series about the 12-year old Mizuki Kouyama who dreams of becoming a singer. The things standing in her way from this dream is her diagnosis of Sarcoma, a cancer that can only be cured by removing her vocal cords, and her grandma which hates music, not letting Mizuki audition. Mizuki’s dream seems unachievable until she’s visited by a pair of Shinigami, telling her she has only one year left to live. 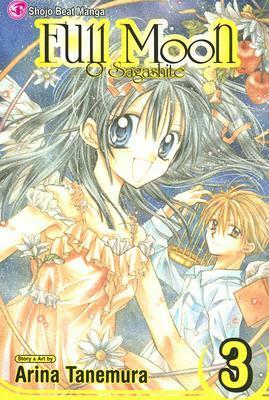 Mizuki and the Shinigami strike a deal; if Mitsuki promises to go quietly when her year is up, they would help her become a singer, so she could leave the world with no regrets.The story of Full Moon wo Sagashite is incredibly cute and inspiring which is conveyed through the amazing artwork of Arina Tanemura. Tanemura has her own very recognizable and unique drawing style, defined by the extremely big eyes (even for Manga standard), incredibly long hair on female characters and a lot of use of the halftone panels, which you either love or hate. The plot is well written, and slowly reveals more about its characters making you slowly get to know and fall in love with them. The only complaint I have about the plot is that everything seems to connect with a bit too much coincidence, but seeing the genre of the manga (Shoujo aimed at young girls) I’m looking past this.Pretty much all characters are relatable, likable and inspirational, expecially Mizuki who keeps appearing positive and happy through all the hardships, and yet it’s revealed that even someone like her feels bad about her experiences sometimes. The Shinigami are all fleshed out with their own backstories carrying some heavy messages I feel are important to teach the demographic the manga is aimed at.All in all Full moon wo Sagashite is a really cute, relateable manga which carries quite some heavy messages. I’d definitely recommend picking the series up if you like Arina Tanemura’s drawing style. This one were less chaotic then the previous volumes so it was more understandable. I still think that the characters are too young for the lovestory aspect though and it seems that the author knows it too because the characters look older in the romantic scenes. Which makes me believe that the author knows that this is a little on the edge and a little farfetched. The third volume steps back from the pop idol music industry and gives all its attention to character development: we see Takuto's involvement in Mitsuki's father's life and we learn the truth about Eichi. Lots of flashbacks here, and I think all of them develop the characters and complicate their lives much better than the music industry bits do - I'm actually involved in the story line now. (view spoiler)[Mitsuki's smile-and-be-happy routine still fits the selfless terminally ill patient trope, but I like the complexity that she can't truly be with Eichi. (hide spoiler)]The fact that everyone from Mitsuki's dad's life is now involved with Mitsuki is pretty unrealistic, along with the amount of death that has followed her. This manga has a ridiculously high body count. The budding love between Eichi and Mitsuki seems strange - he was 14 when he left, and she was 10. That's a pretty big age difference, and it's a little bit creepy.It's a cute story, though it's full of the usual tropes and cliches. The terminally ill girl is perfect and selfless and wants everyone to be happy forever. Of course there's a love triangle (though it does create some character complexity). The artwork is beautiful. Younger YA fans will get the most out of this manga; for me, it was too childish and cliche to love, though I think this is the strongest volume in the series so far. Still trying to get into this series though it hasn't completely hooked me, yet. We find out more about Eichi. Takuto continues to fight off his memories lest he become a ghost instead of a shinigami. Some of the feels in this one worked better than the previous books, but I still find myself reaching to care about why these people supposedly care for each other. The artwork is cute, the outfits are cool, just want to be grabbed a bit harder by the plot. I love the series Full moon. It is one of my favorite manga series. I in particularly like this book because it focuses more on Mizuki feeling's about her past love, Echi, and her friend.Personally I would like to see her and the boy that came from the underworld together. I encourage you to read this series with all my heart. Thanks so much to SeleneScans and MangaArt, who scanslated this series years ago. I am reading V3+ as scanslations, since I only own the first 2 Viz/ShoujoBeat volumes of this series, and I want to finish it. It is soooooo good! Even though this is one of her earlier works I still find Ms. Tanemura's artwork to be stunning and well thought out. The story is both adorable and multi-layered, dramatic, melancholy, and you find yourself falling in love with characters you know you're going to lose. The amount of death in this story is epic. From Mitsuki's parents to both of Eiichi's parents, Takuto committed suicide, now Eiichi is dead and Mitsuki is going to die in approximately 9 months from a similar throat tumor as Takuto. Just wow. The series is actually getting interesting with a plot that's starting to develop beyond the antics of the moment, with characters that are starting to develop an actual personality and back history. The volume ends with a bombshell that'll hopefully keep the momentum strong. my favorite volume! oh my... especially the one chapter with Eichi and Mistuki... Gotta love manga! Wow. Just amazing. The plot teists continue to surprise and the art is fantastic as always. she is amazing! I recommend her! Mitsuki is nearly found out by her doctor and tries her best to conceal her real identity. Strangely though, some unknown force breaks Wakaouji from Full Moon. This book reveals a lot of mysteries you may have been trying to figure out in the series. It's so sweet! Goosebumps at the end of chapter 13 every single time. This story just keeps getting better and better as i read on. I think I actually cried while reading this :p The story is a real tear-jerker.